A donation from the MID contributed to the successful June/July holiday programme organised and facilitated by the Muizenberg Youth Project. 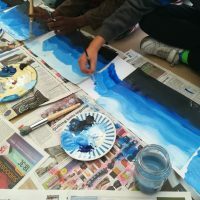 This holiday programme, hosted in the All Saints Church Hall, was generously supported by the Butterfly Art Project, parents, individuals, organisations and businesses in Muizenberg. An average of twenty children and five volunteers attended the holiday programme each day. Children from Capricorn, Muizenberg, Fish Hoek, Retreat and Khayelitsha participated in the three week programme. Activities ranged from puppet making to acrylic and oil collages. The super hero puppet making workshop theme, ‘Coming Together’, focussed on finding common ground and building relationships. The children also went to see the Super Hero Puppet Exhibition in Cape Town and explored the Company Gardens in the City. In addition to this, the holiday programme focussed on overcoming difference through art and discussed community issues such as bullying, fighting, sexual abuse and drunkenness. During this particular workshop the children created individual art work depicting their worries and then they combined their individual art to create a piece that reflected the solution to their worries. The MID thanks Barbara Meyer, founding member and holiday programme organiser, for the amazing work that she’s doing in community transformation through inclusion and participation.